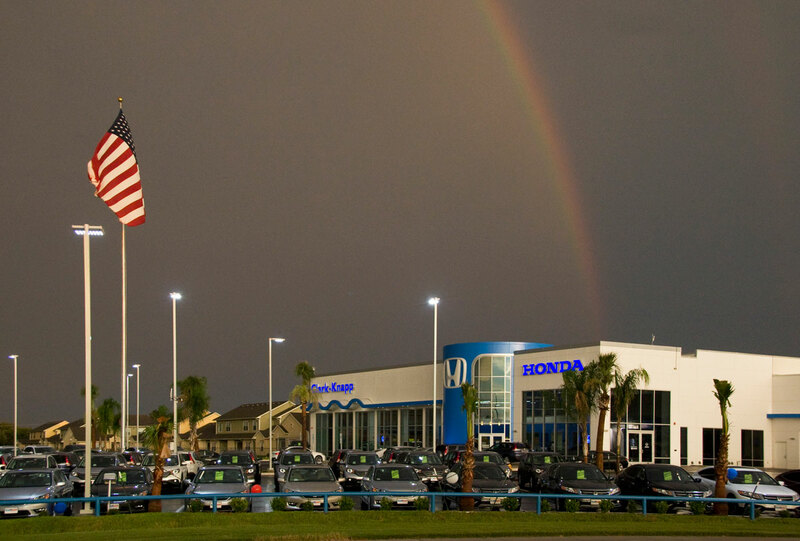 The new Clark Knapp Honda auto dealership in Pharr, Texas, celebrated its grand opening June 18 in a facility that incorporates the American Honda Motor Co.’s Generation 3 prototype dealership architectural design, including an expansive two-story showroom. 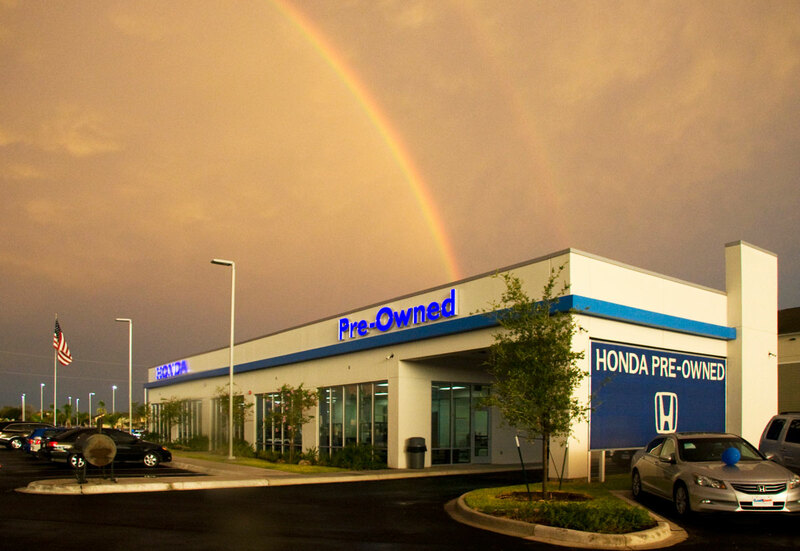 This modern dealership includes the 38,000 square-foot two-story sales showroom, offices, service center, and new vehicle inventory lot located on three acres at the corner of Expressway 83 and Sugar Road in Pharr. Across the street is a two-acre pre-owned vehicle lot featuring a 3,500 square-foot one-story sales office. Interbrand Design Forum, a retail-design and architectural firm headquartered in Dayton, Ohio, has been creating retail brand designs for American Honda Motor Co., Inc., since its 1996-introduction of the Generation1 Honda dealership prototype design that featured the company’s now-signature blue cylinder entry and wave canopy architectural elements – both created from aluminum composite material. The new Clark Knapp Honda dealership is clad in a total of 6,500 square feet of Alucobond® aluminum composite material (ACM) in the 4mm thickness and three colors, including: 4,500 square feet in the custom Honda Motor Co. Blue, 1,200 square feet in Sunrise Silver and 800 square feet in Bone White. These signature architectural elements were introduced in the Honda Generation 1 prototype design, which was focused on “creating a friendly atmosphere attuned to the female shopper in the marketplace,” according to Williamson. 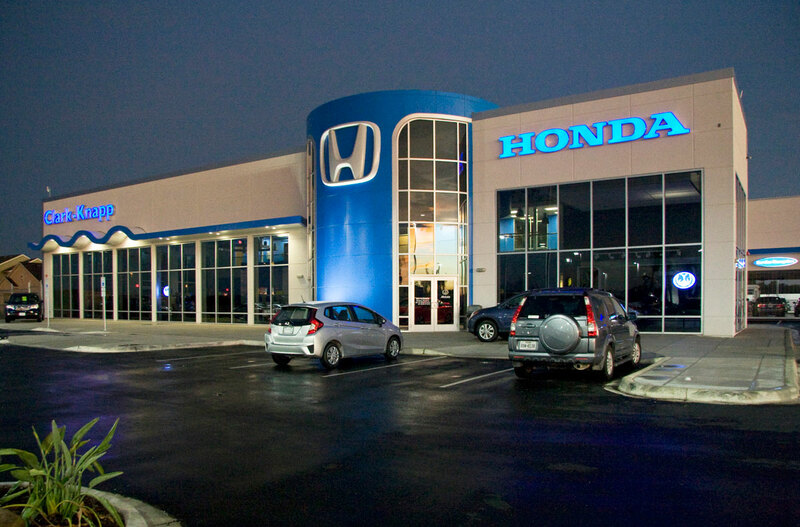 The 2002-introduced Generation 2 Honda dealership design offered an interior update, while 2011’s Generation 3 dealership design featured both interior and exterior upgrades. Bob Simpson, AIA, principal of McAllen, Texas-based Boultinghouse Simpson Gates Architects, Inc., worked with Clark-Knapp Properties, Ltd., of McAllen, and Interbrand Design Forum to adapt the Honda prototype design to meet owner requirements for this specific site within Honda design guidelines, including incorporating Honda’s Generation 3 materials and color specifications. 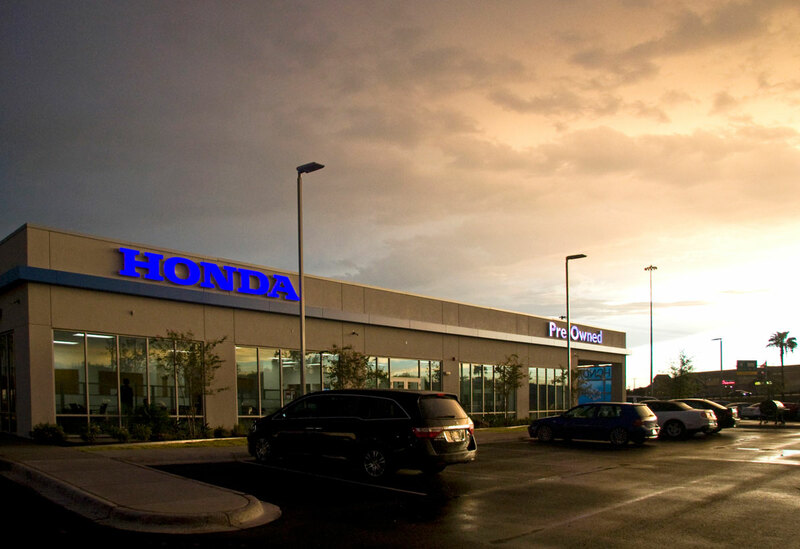 The new Honda dealership in Pharr was designed to replace the existing Clark Knapp Honda dealership in downtown McAllen. 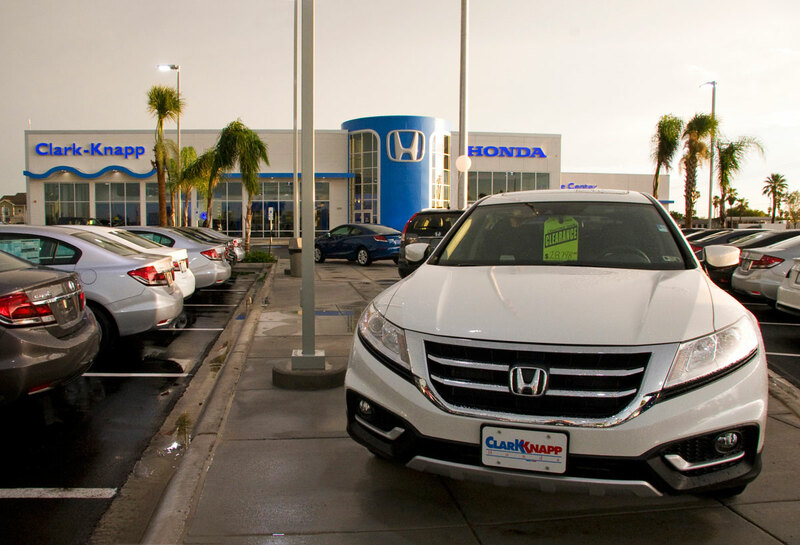 The Clark Knapp Honda dealership features an open two-story showroom with second-floor offices that are separated from the showroom by a glass railing. Parts storage areas are provided on both the first and second floors. The first floor is designed with sales and break-room areas, a children’s play area, a customer waiting area and a retail-sales boutique. The attached one-story service center features service bays and a car wash.
“We utilized the prototype building plan and adapted it to fit this specific site so it would work well architecturally and also allow us to incorporate value engineering,” said Simpson. Architectural design was completed in November 2012 with construction started in February 2013. The Alucobond panels were fabricated by Bowman Distributing Co., of San Benito, Texas, which installed them with a rout and return wet-seal system. D. Wilson Construction Co., of McAllen, served as general contractor for the project. “Fabricating the wave canopy – including the trim and curved panels on top and bottom – was challenging,” according to Juan Marchan, general partner, Bowman Distributing, who said the company created its own canopy model through a series of design templates and photos loaded into AutoCAD computer software for use with a CNC router. “We’ve completed similar unique designs, but this one was quite challenging because of the fascia,” said Eduardo Richa, general partner, Bowman Distributing. “Not only did the canopy feature a curve but a carved fascia with a return. Alucobond routes on a CNC machine very well compared to other products. … We’ve used Alucobond for years. Fabrication of the Alucobond panels was begun in March 2014 by Bowman Distributing, which completed installation in May. 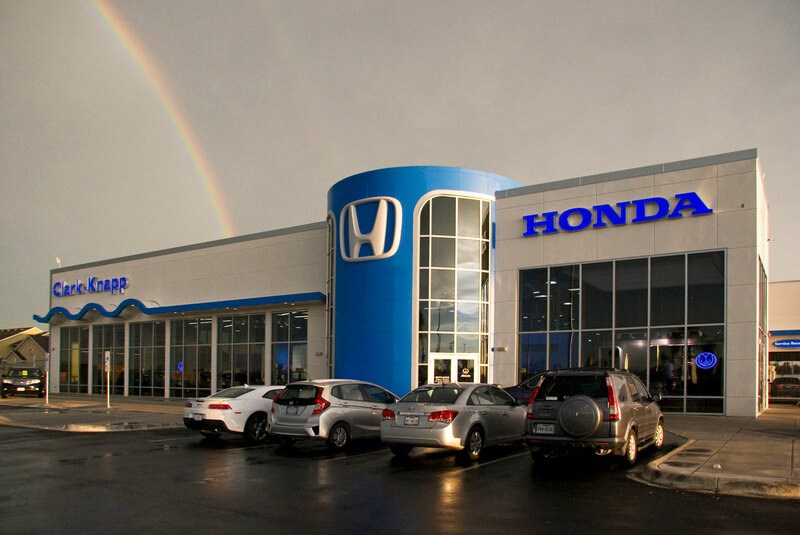 American Honda Motor Co. revises its dealership prototype design every four to five years, according to Williamson, who said that updated dealerships usually see an uptick in business. Great site and thanks for sharing with us.